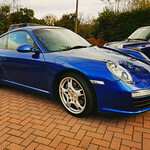 On the look out for a 997, if you are thinking of selling yours, then please get in touch. Would prefer a 997.2 PDK but will also consider a 997.1 manual with an engine rebuild. Ideally an interesting colour - Black cars need not apply. Open to coupe or cabriolet. I am in Tunbridge-Wells, Kent but will travel for the right car. What sort of budget are you working to? Sorry missed that information out. Between £25-£35k depending on age and miles, etc. Theres a nice 58 plate grey one on autotrader for £27,500. I'm not ready to buy yet but thought I would mention that one. Theres also a nice Black C4S on Pistonheads with a C4S number plate thats had a Hartech rebuild. Good cars tend to move quickly. I'm checking everyday for a car that matches my spec. Why so many Black cars? Hi, Is your max budget £35K? I have a very "un black" 997.2 C2S in GT Silver with cherry red interior that I'm considering selling. It's done 37k 58 Plate MY09. jfyi Ben's bought a car. p0jy might still be looking. OP bear in mind when you search 911’s suddenly aren’t selling, I’m not sure there moving fast anymore? Or could just be in the lower price bracket? also I’d be very careful about owners valuations on here, often private valuations are actually closer to OPC prices. I’d also be careful at OPC prices, plenty of variation on very similar spec cars. Spongebob - are you saying you think 997.2’s are falling in price? Yes they definitely are, using my yardstick (Colini) 997 GTS prices are finally falling, theres plenty sitting and not selling due to their overinflated prices, OPC's certainly are starting to reduce them 2-4k to sell them. Clear evidence here http://911uk.com/viewtopic.php?t=127091 car was 70k when I started that thread, today 66,500. Spoke to a few well know dealers in the last week or two and one in particular says they are 25% down on sales from this time last year. He also said that to get a sale they have to be very flexible on their pricing. Cars just a'int selling like they used to so if your in the market to buy looks like the time is right. As mentioned above there are quite a few GTSs that aren't shifting so slowly coming down in price. From what I have seen 997.2 prices are pretty much holding up but they are taking longer to sell. Also, I think there are the odd bargains available. I inquired about a GTS convertible and was offered £34k PX for my 2009 C4S with 65k miles. I bought it private for £37k 2 years ago. I suspect due to the current climate of uncertainty people are holding off of big purchases. I dont think close to £1.50 a ltr for v max helps thirsty engine sales and the continues uncertainty of whats happening over leaving the EU and how it will affect jobs, trade etc. lower than expected GDP . All major purchase sales inc houses are sluggish at the moment . Whats interesting is now we are all much better informed of the signs of slowing markets ,we as people react tightening spending far quicker then in the past so the trend hits the high street much quicker than say 10 yrs ago . The good news is we are also well informed when confidence returns and start spending quicker again so the recovery is faster . A good qtr GDP and those morons in power pulling their fingers out over the EU and it will recover very quickly . I hate to be the bearer of bad news but 997.2 prices are not holding up so well at all. As Phil says it's all this uncertainty around this ruddy Breaksit which seems to be a swirling mass of confusion, drop into that the stock market taking a bit of a hammering recently with all the Trade wars that a certain person is stirring up and people are just not splashing out on expensive motors. Car sales in general are well down year on year. You’re spot on with that point. The overall uncertainty created by Brexit, lack of consumer confidence has affected just about everything from the things in the supermarket shelves through to cars. I don’t think it’s specific to any particular models. Certainly, as a brand Porsche are seen as a luxury proposition and potential good investment. The latter point has encouraged people to take their money from the bank and transfer it to a car where gains are more likely and tax free. Cars like the 997.2 are not seen as investments per se (unless something very unusual) but for people like me they are a good place to put some money that has seen the majority of its depreciation and is flat on value. In a flat market or even one declining very slightly, it’s a good place to “trade up”. Trading down or out altogether will inevitably result in losing money. Cash ISA = yes - stocks and shares ISA = much better than that!